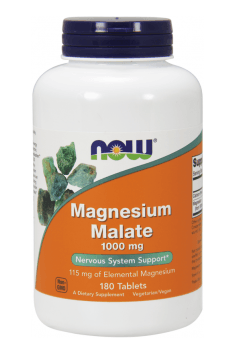 Magnesium Malate 1000mg 180 tab. One capsule three times a day after meals. A key element of life. Due to the common problem with magnesium deficiency, it should be permanently supplemented by everyone. The manufacturer recommends using one capsule 2-3 times per day, after a meal. This is the appropriate dose for a person who does not abuse coffee (it washes magnesium from the body), who uses a properly balanced diet, is not stressed out, and living in peace and harmony. Physically active people are recommended to take higher doses - suggesting 2 capsules, 2 to 3 times a day. They can be taken in the afternoon. Magnesium has a gently sedative effect, so it can be enjoyed at night, as it's relaxing and positively affects sleep. Remember that magnesium is a calcium antagonist, so it should not be combined with calcium-containing supplements or eaten with food which has a source of calcium.